The sentiment expressed by Jenny Holzer and Lady Pink’s collaborative painting, ‘I Am Not Free Because I Can Be Exploded Anytime’, 1983–84, sends out a prescient message, not only to Sterling Ruby, who lifted this title for his solo show at Sprüth Magers, but also to the social milieu that surrounds Berlin’s Gallery Weekend. The work’s dark spray-painted surface with its sloganed truism speaks as much of apathy as it does of social-claustrophobia when viewed through the lens of today’s audience. And, for the mix of collectors and gallery goers populating Berlin’s streets as they bisect the city from gallery to gallery, it serves well as a counterpoint to the festive consumption of the three-day event. Ruby’s own work in Sprüth Mager’s main space is assertive and intentionally brash. Phallic upright sculptures counteract horizontal stacks of spray-painted oblong blocks, while globular fabric shapes drip from the ceiling and cling to walls. The dynamism of these gargantuan masses plays with the oppressive and dominant possibilities of scultural form, while the contradictory tactile renderings—plush-toy-soft or glistening candy sweet—appear seductive and sexual. The painting, from which Ruby aptly appropriated the exhibition title, hangs upstairs alongside works by Robert Morris and Rosemarie Trockel. The work gives emphasis to the subtleties of Ruby’s outlandish practice and a historical context from which he can express his contemporary viewpoint. Rosa Barba’s film, ‘The Hidden Conference: about the discontinuous history of things we see and we don’t see’, 2010, at Carlier Gebauer, also rings true with concerns of historical work and shifting contexts. Filmed in the archives of the Neue Nationalgalerie, Berlin, it documents the lives of works dormant in the gallery’s storage halls. With the energies and excesses of 35mm film production, she reasserts the stored works’ status by returning them to the present tense, if only to commemorate them for their abandonment. Barba’s smaller, intimate works ‘One way out’, 2009, and ‘Invisible Act’, 2010, are also concerned with the mechanics of film as a medium, and the status its use implies—historical and often times archival. In both works, celluloid’s movement through the projector is emphasised, highlighting a history writ into the surface of the film and underlining the invisible impact of time and duration on an artwork’s reading. In ‘One way out’, a long strip of film flows out of the projector, up a relentlessly vacuuming ventilation tube, and back down again into the projector, while ‘Invisible Act’ sandwiches a shiny ballbearing between the revolutions of a strip of film. New work ‘Optic Ocean’, 2011, implies similar connotations of time and duration, but to a silkscreened canvas that catches the viewer in a battle of sense with what appears to be a projected image. It is, in fact, a slightly offset projection atop a printed rendering of the same text. This dialogue coaxes the viewer into looking at the work as if it were a moving image; an act that inscribes the painting-like-object with a sense of immediacy and temporality. Katherin Sonntag explicitly engages with these contemplative gestures—the act of making and the site of production—in her exhibition Double Take, at Galerie Kamm. Comprising a 1:1 wallpapered replica of the artist’s studio, the gallery alludes to the site of production in an illusionary drama of perspective and space. All the while, the suggestive, ‘Blame it on Morandi’, 2011—a carousel of 81 slides—loops in the gallery darkened entryway; a jazz swing beat accompanies the slides, which document the artist’s studio with crime-scene-like analytics. For Sonntag, the site of production becomes her subject and the work becomes a document of a space that is still and inactive. By re-homing her space of production within the gallery’s space of consumption, she circumvents the usual channels of art making, instead choosing to elevate the site of production to the extent that singular artworks, such as the sculptural ‘Mimikry #2’, 2010, and collage ‘QUODLIBET’, 2011, are both consumed within the expansive installation. Nairy Baghramian and Nina Canell both assert a similarly contemplative approach to making in galleries on opposite sides of the city. Just off Kurfürstendamm, Baghramian presents her first solo show with Daniel Bucholz. The exhibition title, Formage de tête, is at once a play on words and a serious address to modes of production. An array of inverse rubber moulds lie flat on wire frames which represent tables. Elsewhere, the lids from giant serving trays hang on vertical rods. Baghramian imples ‘the artist’ has served up these rubber forms to be scrutinised for their metaphysical significance, pertaining to some other purpose. At Barbara Wien Wilma Lukatsch in Mitte, Nina Canell’s exhibition Heart of the Matter talks of recollection and reconstruction. 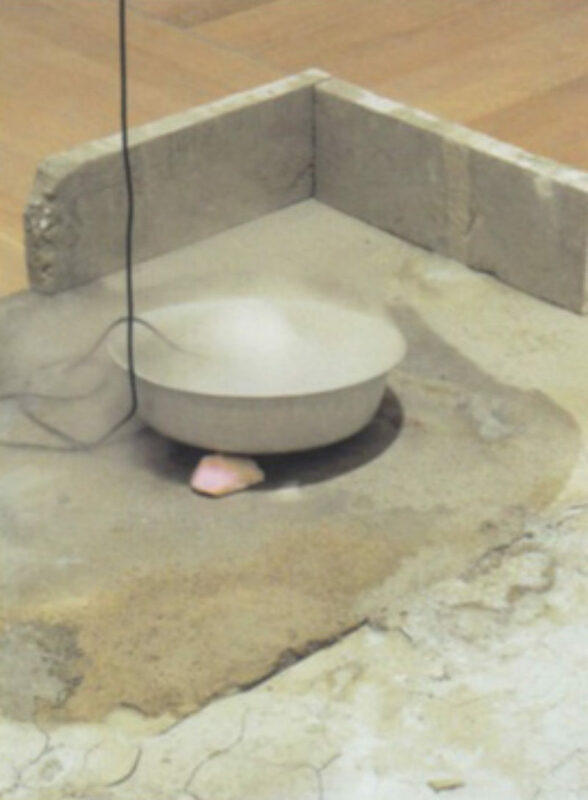 ‘Another Ode to Outer Ends’, 2010, simmers as wispy smoke pours over the lip of a bowl atop this floor-based work. Dusty and concrete grey, the piece resembles a section of flooring removed from a building site and relocated to the gallery. But on closer inspection, its fragility contradicts first impressions. Like the other works on show, its emphemeral quality determines a more intimate relationship with the viewer and its delicate surfaces. Canell’s successes are most apparent when the work engages the viewer in the details she invests so much time and care implementing. While visiting a succession of solo shows presents interpretative challenges and dangers of cross-pollination, the combination of Santiago Sierra’s work with that of Cady Noland at KOW establishes a dynamic socio-political dialogue. Noland’s ‘Enquirer Page with Eyes Cut Out’, 1990, is an accessible allegory for illusions of grandeur and, in the present tense, the temporality of this elevated status. 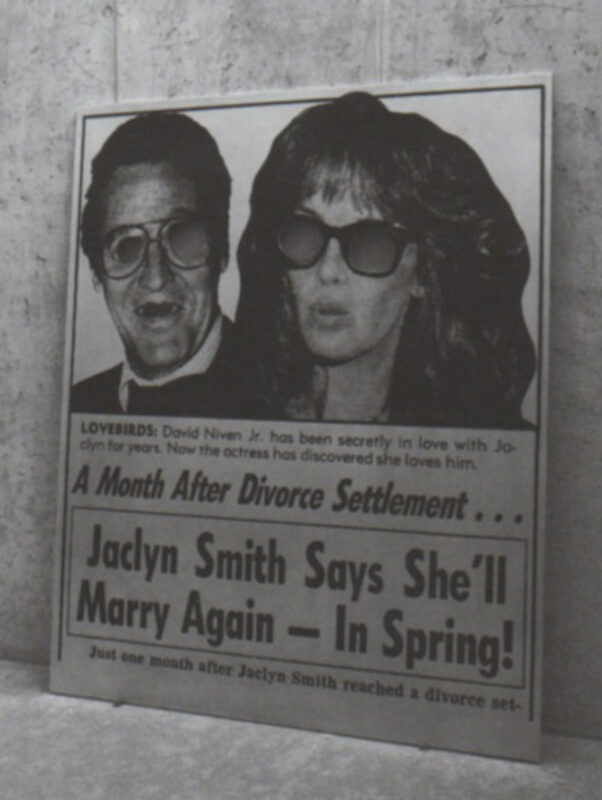 The once instantly recognisable (and now eyeless) Charlie’s Angels star, Jaclyn Smith, appears alongside the lesser-known David Niven Jr on a blown-up reprint of a newspaper headline. Like a tombstone, the work stands testament to the degradation time executes on the popular psyche and collective consciousness. 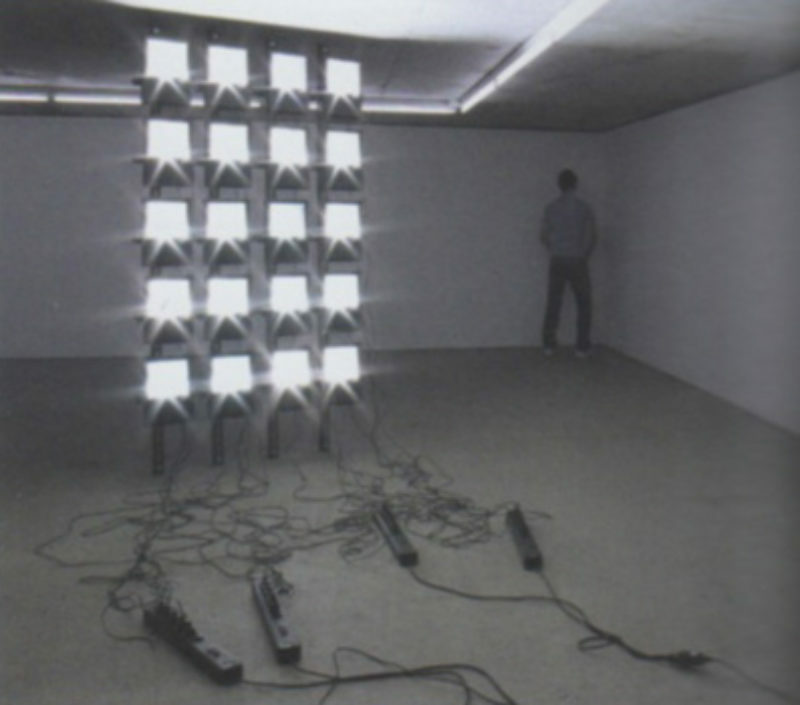 Sierra’s ‘Audience Lit by a Petrol Operated Generator’, 2008, on the other hand develops a dialogue more attuned to the subtleties of a viewer’s relationship to an artwork. 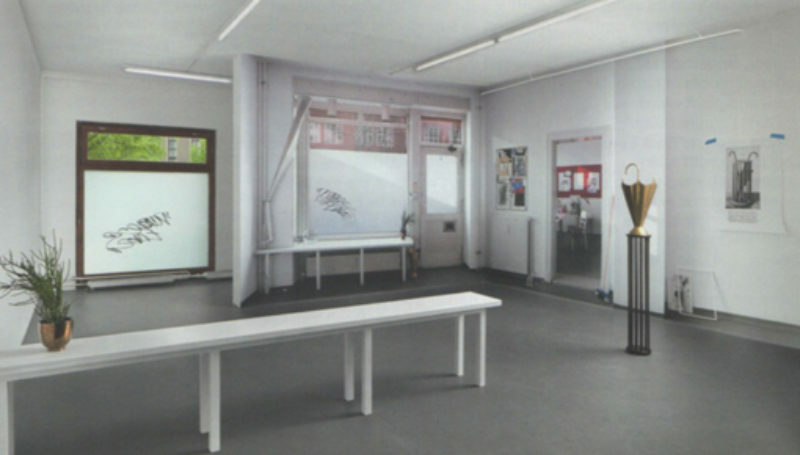 While a grid of floodlights blind the gallery, the counterpart of the work (the viewer) witnesses the imperceptible expenditure of fuel, all for their own private enjoyment. With political connotations abound, Sierra illuminates the harsh reality of the individuals’ social responsibilities. Here, both artists comment and reflect on society, and the buildings’ industrial concrete fabric amplifies their sentiments. While collectively the exhibitions included in this three-day weekend are inevitably disparate and far-ranging, the resounding message that our perceptions and modes of understandings are as malleable as an artists’ materials rings true. From here, we are able to position ourselves in relation to the city, to each other, and to the social sphere to which we contribute.